Fall in Wisconsin is covered in colors worthy of extra oohs and ahhs. A great way to experience this is with a scenic drive. Here are the best fall color drives in Northern Wisconsin. Mary is an outdoor enthusiast living just steps from Lake Superior. She's a proud supporter of the byway. Check out Houghton Falls State Natural Area. An easy hike past the enchanting Echo Dells leads to a scenic bluff overlooking Lake Superior. Cafe Coco in Washburn is my go-to spot for irresistible treats - be sure to try the cinnamon rolls! Lastly, head to Bayfield Apple Fest. It's one of the top regional food festivals in the country! Explore the beauty of Apostle Islands National Lakeshore. Take in technicolor houses in charming Bayfield. Hang at Maggie's, a legendary eatery with wacky decor. Peruse shops and crafts in cute Cornucopia. Savor the scenery at Frog Bay Tribal National Park. Pick sustainably-grown fruit at Blue Vista Farm. Myles is an Egg Harbor native, bicycle explorer and writer/editor for Peninsula Pulse. Even locals make the trek to the northernmost tip of the peninsula to see the famous "Curvy Road," that winds through the color-bathed trees. Be sure to head over to Door County Brewing Co. to try Verses, one of their Belgian-inspired beers. Don't miss Charlie's Smokehouse, where they smoke whitefish, fresh off the boat daily. Live like a local at a traditional Door County fish boil. Feast your eyes on a picture perfect Ephraim shoreline. Savor the flavors of fall at apple orchards and wineries. Explore the lighthouse at Peninsula State Park. Devour BBQ & patio views at Casey's BBQ & Smokehouse. Find peace while hiking at Whitefish Dunes State Park. A Northwoods resident for more than 40 years, R.T.'s favorite season is syrup season. It's amazing how colors pop against the brilliant pines in the Nicolet Forest. Hop in a kayak to explore one of the area's countless waterways. Wildlife lovers can hike at Knowles Creek Interpretive Center. And when hunger strikes, head to Hotel Crandon for a reuben and craft beer or try sushi (yes there is sushi in the Northwoods!) at On Deck. From car or kayak, see the scenery in Forest County. Check out Forest County Potawatomi Museum & Cultural Center. Brace yourself for breathtaking sunsets in Wabeno. Ed's Lake trail in the Chequamegon-Nicolet National Forest. Ride the Lumberjack Steam Train at Camp Five Museum. Allyson is self-proclaimed foodie, frequent festival goer and local Chippewa Valley enthusiast. Take your friends and family to the Ice Age Interpretive Center for great views of the land formed by glaciers. 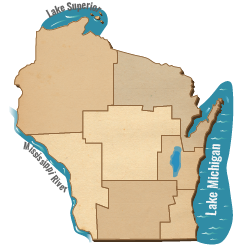 You can also hike an awesome portion of the National Ice Age Trail. Stop for dinner at Birch Point Resort for their Saturday night seafood buffet, or make quick friends over fruit wine at O'Neil Creek Winery in Bloomer. Hit the trails at Chippewa Moraine Ice Age State Recreation Area. Catch a view of Jeanstow Lake in Chippewa County. Take in colors on County Road E - a WI Rustic Road. See stunning fall foliage at Brunet Island State Park. Rustic Road 62: County Hwy RR to Timm's Hill County Park. Rustic Road 60: County Hwy K from Star Lake to Boulder Junction. Vilas Co.
Rustic Road 1: County Hwy D north of Rib Lake in Taylor County. Check out some of the best fall drives in the southern part of the state!